Cigar boxes are real great, because they can hold a whole mess of treasures and they got cool pictures of Indians and kings on ’em. 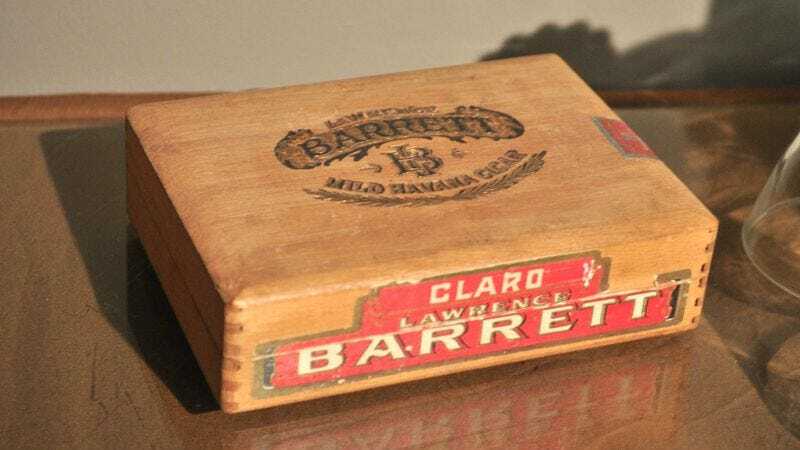 Here are 10 neat things that fit into an old cigar box. Let’s get the obvious one out of the way. You’re gonna keep your rookie cards of Smashin’ Jack Thompson, Gallopin’ Mick Smasher, and Lightnin’ Jimbo Kelly in your cigar box. A cigar box is a great place to keep your jacks and the bouncy ball you use to play jacks! These touched a real train! Keep ’em in the cigar box. When you’re done running in a circle blowing on a whistle for three hours, keep it in the cigar box, and hide the cigar box in a bush or under a chifferobe. Until you sell the arrowheads you found to a museum for a hundred dollars, they are right at home in your cigar box. After you pretend you are a wizard or Santa Claus’ boss, keep your beard moss in the cigar box. You found these while walking through Fowler’s Hollow. You filled up a whole backpack with them. They are as sweet and fragile as your fleeting childhood since you started to notice girls. Keep them in the cigar box a while longer. You don’t want to lose your Boy’s Hat. What else are you gonna wear when you play dirt ball in the weed field behind the tractor parts factory? You saved up a long time for that watch! Better keep it safe! Sick! Keep ’em to gross out Glen, Tommy, and the rest of the gang!